Third Age can be a time of renewal and transformation if we regard it as an opportunity as well as a challenge. Its opportunity lies in seeing our life as full of possibility, as a process of continual and surprising unfolding, and in knowing that we can make decisions geared to regeneration and fulfillment. Its challenge lies in our "response-ability" to give back, to find the best way for us to contribute our gifts, talents, experience and wisdom to address the needs of our communities and our world. Third Age requires us to make those daily choices which help us to co-create, along with the people and circumstances of our life situation, the kind of living we want to claim for ourselves in the second half of life. 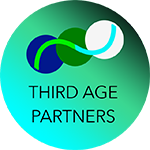 We offer resources to help you meet the challenges and opportunities of Third Age.